Lady Spectra & Sparky to the rescue! 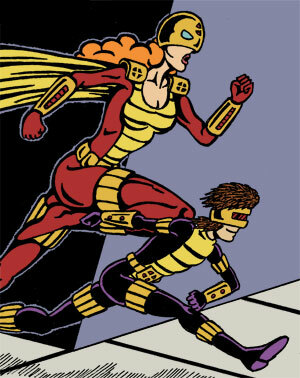 Lady Spectra & Sparky is a superhero comic created by J. Kevin Carrier. It began as a series of self-published minicomics in 1991, and began appearing as a webcomic in 2008. Schoolteacher Paula Carson and her daughter Jill are secretly Lady Spectra & Sparky, the costumed crimefighters of Apollo City. With their laser wristbands and other gadgets, they battle such supervillains as Repo-Beast, Black Sundae, and Skullduggery in Silver Age-style adventures. An Aesop: Lady Spectra is prone to lecturing. Lady Spectra: Compassion, Sparky. It's the thing that separates us from the animals. Don't ever forget that. Applied Phlebotinum: White Hole energy, which can be used as anything from a laser to a force beam to an invisibility field. Canon Welding: Sparky shared an adventure with Glorianna, when the latter was briefly transported to the 21st century. Clothes Make the Superman: Spectra & Sparky's powers come from their wristbands and other gear. Comes Great Responsibility: Lady Spectra was inspired by the exploits of other superheroes to become a crimefighter. The Commissioner Gordon: Lt. Bernie Kominsky, head of the Apollo City police department's "Super Villain Unit". Easily Thwarted Alien Invasion: In the very first story, Sparky fends off an angry alien UFO pilot by offering him a bouquet of flowers. Find the Cure! : Spectra seeks a cure for poisoned ice cream in "I Scream, You Scream". Fish out of Temporal Water: Spectra is transported to a primitive world in "The Killer's Replacement" — more specifically, the world of Glorianna, JK Carrier's other major comic character. Guest Strip: Other writers and artists have frequently pitched in. Hell Invades Heaven: In the "Ultra Squad: Demon War" storyline. Hero's First Rescue: Before becoming Lady Spectra, Paula Carson gets her first taste of action when she defends her laboratory against an intruder. Home Base: A converted lighthouse. Mama Bear: Lady Spectra, particularly in "I Scream, You Scream" when Sparky is poisoned. Massive Multiplayer Crossover: The "Ultra Squad: Demon War" storyline featured guest-stars from several 1990s mini-comics, including Mister Mid-Nite, Doc Saphire, Cassiopeia the Witch, and Madame Boogala. Perilous Power Source: The White Hole energy that powers Spectra & Sparky's equipment is potentially deadly at higher intensities. Reed Richards Is Useless: Justified by Lady Spectra's promise to her husband not to let the military get hold of their technology. Secret Identity: Schoolteacher Paula Carson. Teacher/Student Romance: Paula and Prof. Carson. Thememobile: The Prismobile, a car shaped like a giant flashlight. Those Wacky Nazis: Sky Death, the White Knights and various other villains. Training the Peaceful Villagers: Spectra leads a peasant revolt against a cruel landowner in "The Killer's Replacement". Where Does He Get All Those Wonderful Toys? : A lighthouse headquarters, a souped-up car, and other hi-tech gear, all on a teacher's salary.